Landscaping adds a very attractive look to your property allows you to use these open areas more productively and increases the value of your home as well. This is why it’s important to have well planned landscapes that last long with the least amount of maintenance. This is where hardscaping comes into the picture. The masonry elements on your property are the base or foundation of various other features. Once these are installed well, it helps maintain the integrity of the landscape and provides support to any other installations and features that are eventually installed in that area. We at Emerald Creek Landscapes, LLC are a well-established company in the landscaping field and have been serving customers in Ringgold, East Brainerd, and Fort Oglethorpe. Our experts have successfully completed a large number of hardscape design and installation projects across East Ridge, Dalton, Chattanooga and Red Bank as well. 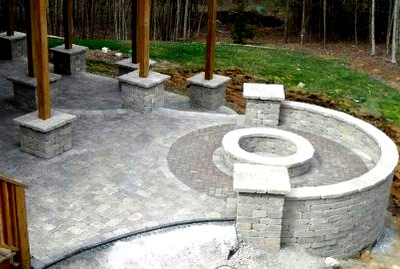 We have also catered to customers in Middle Valley, Cleveland, Soddy-Daisy, Calhoun and the surrounding areas and created beautiful hardscaping elements on their properties. Surveying - Our experts will first survey the available space. Consultation - They will have detailed discussions with you to understand what your specific requirements are; they will also provide recommendations on features and the materials to be used. Planning and Design - Keeping all your requirements, ideas and preferences in view, they will provide plans, designs and quotes. Approval - Once you have approved the plans and quote, the work will be started at a time and date convenient to you. Project Management - We handle every aspect of the hardscape construction project and make sure that it moves forth in a glitch-free manner. Our on-site supervisors will ensure that top quality materials are being delivered and that our personnel are working efficiently. All our work is completed to industry standards and we maintain constant communication with you during the course of the project. We also make sure that the work is completed to your 100% satisfaction. With the vast experience and expertise we have developed over the years, we know what it takes to provide excellent solutions at very competitive hardscaping cost. Not only does this ensure you have very resilient and long-lasting hardscaping features, but that you get value for money too. We handle hardscaping as part of broader landscape design and installation projects as well as yard upgrades. No matter how big or small your requirement; we are the experts that can provide you the solutions you need.